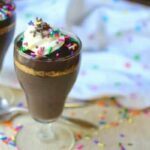 This is an easy, rich, chocolatey, homemade chocolate pudding that takes almost no time at all to make - just 8 minutes from measuring to eating! Mix dry ingredients together in a large, microwave safe bowl, until there are no lumps of cocoa or cornstarch. Add the milk slowly, whisking smooth as you add it. Whisk in the cream just until it's smooth. Put in the microwave and cook, stirring every minute, until mixture is thick and coats a spoon - about 6 to 9 minutes. Remove from microwave and add butter in small pieces, whisking it in to blend. Cover (or not) and chill until ready to serve. Cover the hot pudding with waxed paper while cooling if you don't want a skin to form on the top. Some people like the skin so in that case leave it uncovered!